On Saturday, February 2, Standardbred Canada announced the winners for the 2018 O’Brien Awards, at the 30th edition of the annual O’Brien Awards Black Tie Gala held at the Hilton Mississauga / Meadowvale hotel in Mississauga, Ont. The O’Brien Awards honour Canada’s best in harness racing over the past season and are named in honour of the late Joe O’Brien, an outstanding horseman and member of the Canadian Horse Racing Hall of Fame. Richard Moreau of Puslinch, Ont. won his sixth consecutive title as Canada’s Trainer of the Year. He put up some incredible numbers in the 2018 season, sending 315 winners postward and training horses to more than $4.6 million in earnings, a new personal best. He was the leading trainer in both wins and earnings at Woodbine Racetrack’s final meet and at Woodbine Mohawk Park. Moreau trained O’Brien Award winner Jimmy Freight for part of the sophomore season including his victories in the Ontario Sires Stakes and Somebeachsomewhere. Other top performers from the Moreau Stable in 2018 included pacing colt Backstreet Shadow, trotting horse Big Rich, and pacing mare Witch Dali. Casie Coleman, the runner-up in this category, did not go home empty handed as two of her horses, McWicked and Stag Party, garnered awards. McWicked picked up two O’Brien Awards, one as Older Pacing Horse of the Year and the other as the Somebeachsomewhere Horse of the Year. Trained by Coleman for Ed James’ SSG Stables, McWicked dazzled fans throughout North America this past season winning almost every major event for older pacers and putting together the best single-season of his illustrious career, winning 12 of 19 races and more than $1.6 million, while boosting his career earnings to more than $4 million, making him one of the richest pacers in the history of the sport. The world champion pacer posted major wins in the Ben Franklin Memorial, and William Haughton Memorial. The son of McArdle rattled off five straight wins to end the season, including major victories in the $430,000 Breeders Crown Final and the $350,000 TVG Final. McWicked’s most lucrative victory came on home soil in the $600,000 Canadian Pacing Derby at Woodbine Mohawk Park. Stag Party, trained and co-owned by Coleman, was voted Two-Year-Old Pacing Colt of the Year. The son of Bettors Delight enjoyed a brilliant rookie season in 2018 that included six victories and almost $670,000 in purse earnings. The colt didn’t miss the board in any of his nine races, with his biggest victory in the $890,000 Metro Pace. Louis-Philippe Roy took home his first title as Canada’s Driver of the Year. His O’Brien Award honour for the 2018 season is a result of a career year that included 416 wins with total purse earnings in excess of $7.4 million. He topped the Canadian driver charts for both wins and earnings and was the leading driver in both wins and earnings at Woodbine Racetrack and Woodbine Mohawk Park. Roy recorded his 1,000th career driving victory with HP Titania Runner on August 10 at Woodbine Mohawk Park in an Ontario Sires Stakes event, and was also the winner of the Lampman Cup for 2018 as he finished at the top of the drivers’ standings in the Ontario Sires Stakes. Roy was the regular driver for O’Brien Award winners Shower Play and Jimmy Freight. Guy Gagnon of Gatineau, Que., was named the winner of the O’Brien Award of Horsemanship. Gagnon is a regular trainer-driver at Hippodrome 3R and Rideau Carleton Raceway, where he topped the driving charts for wins in 2018. Gagnon posted impressive numbers in both training and driving in 2018 with 209 wins and $1.1 million in driving earnings along with 59 victories and more than $352,000 in training earnings. The Captaintreacherous filly Tall Drink Hanover was voted Two-Year-Old Pacing Filly of the Year. She was a top-three finisher in all but one of her 11 races and earned more than $455,000. She swept the Whenuwishuponastar, the Shes A Great Lady, and won a division of the Eternal Camnation, all at Woodbine Mohawk Park. Shower Play was voted Canada’s Three-Year-Old Pacing Filly of the Year. The Shadow Play filly scored six wins during her 2018 campaign, including three Ontario Sires Stakes events, the Fan Hanover Final and Simcoe division. She bankrolled almost $480,000 and took a mark of 1:50.2 in the Fan Hanover Final at Woodbine Mohawk Park. 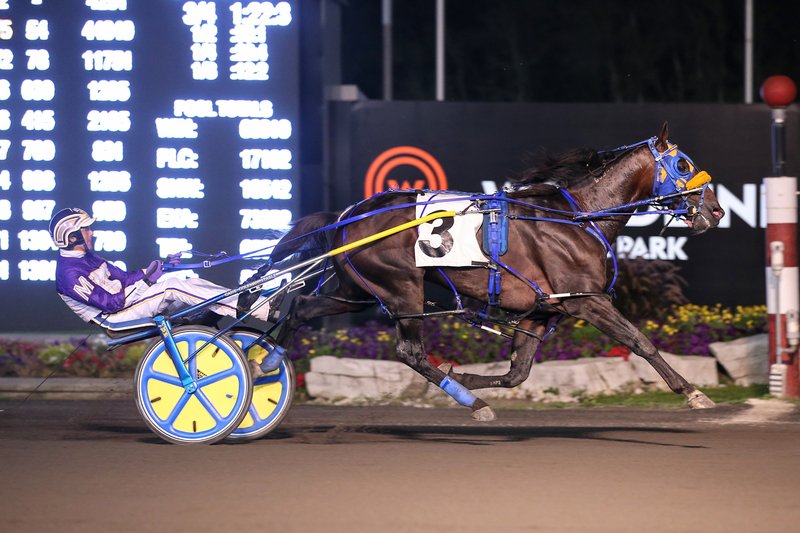 Jimmy Freight took the title of Canada’s Three-Year-Old Pacing Colt of the Year. The son of Sportswriter won 11 races and more than $834,000, while collecting victories in all five Ontario Sires Stakes races he competed in, including his season-ending Super Final. He also won eliminations of the Messenger and Progress Pace, and finished his season with a runner-up finish in the Progress Final. Older Pacing Mare honours went to the warhorse Exhilarated, who started 44 times from January through December while winning 11 races and $211,000 in purse money. The Carmen Auciello trainee was a regular competitor in the Fillies and Mares Preferred ranks at Woodbine Mohawk Park. In the Two-Year-Old Trotting Filly division, The Ice Dutchess, a winner of five races and $472,000, was voted the winner. She swept the Peaceful Way Stakes at Woodbine Mohawk Park and won her Bluegrass Stakes division at The Red Mile. Forbidden Trade was voted Two-Year-Old Trotting Colt of the Year. The son of Kadabra won seven races and $300,000, including his Ontario Sires Stakes Super Final and four additional OSS events. The Kadabra filly Illusioneesta was named Three-Year-Old Trotting Filly of the Year. Trained by Per Henriksen, she won four races and more than $241,000 in 2018. Two of those wins were in Ontario Sires Stakes events. In the Three-Year-Old Trotting Colt division, Run Director was voted the O’Brien winner. The son of Kadabra had six wins and purse earnings exceeding $436,000 last season. Four wins came in Ontario Sires Stakes events, including his OSS Super Final victory. Older Trotting Mare honours went to Emoticon Hanover, who was a winner of six races and more than $397,000 during her five-year-old campaign. She put an exclamation mark on her stellar season with a three-race win streak that included the elimination and final of the Breeders Crown and the TVG for trotting mares. Will Take Charge was voted Older Trotting Horse of the Year. The talented trotter won nine races and more than $492,000. The son of Kadabra eclipsed one million dollars in career earnings in 2018 and scored victories in the Maxie Lee Memorial Invitation and the Crawford Farms Open Trot. In the Armstrong Breeder of the Year category, Seelster Farms of Lucan, Ont., was voted the winner. Seelster-bred horses earned in excess of $3.4 million in 2018, and included O’Brien finalists Bronx Seelster and Nirvana Seelster. Chris Lancaster of Airdrie, Alta. was the Future Star Winner. In his first full-time year of training, Lancaster conditioned 29 winners and horses that earned $216,000 while racing primarily at Fraser Downs, Century Downs and Northlands Park. Lancaster trained the stakes-winning two-year-old pacing filly Rockin Mystery for the latter part of her season, which included an Alberta Sires Stakes Super Final victory. Trevor Forgie and Scott Lecain were named co-recipients of the Outstanding Groom Award, sponsored by the OLG. In the early morning hours of December 21, a devastating fire broke out in the barn leased to trainer Mark Steacy, at First Line Training Centre near Guelph, Ontario. Forgie and Lecain, both employees for Steacy, were two of the first people to arrive at the scene. Their courageous efforts resulted in 33 of the 38 horses being saved. Written by Ric Chapman, Oakville, Ont. Clive Cohen, North York, Ont. Latest News Stay in the know with our weekly horse racing updates. Standings And Results Your official source for results, data and statistics on all horse racing types.